The 2019 Fine Woodworking’s Shop Giveaway: Upgrade to Laguna Sweepstakes (the “Sweepstakes”) is open only to legal residents of the fifty (50) United States (and the District of Columbia) and Canada (excluding Quebec), who are at least eighteen (18) years old at the time of entry. Void in Quebec and where prohibited. Proof of residency and age may be required. Employees and directors of The Taunton Press, Inc., publisher of Fine Woodworking® Magazine and their subsidiaries, divisions, affiliates, and advertising or promotional agencies or individuals involved with the design, production, execution or distribution of the Sweepstakes and the immediate family and household members of such individuals, are not eligible to enter or win. “Immediate family members” shall mean parents, stepparents, children, stepchildren, siblings, stepsiblings, or spouses, regardless of where they live. “Household members” shall mean people who share the same residence at least three months a year, whether related or not. In order to enter the Sweepstakes or receive the prize, you must fully comply with the Official Rules and, by entering, you represent and warrant that you agree to be bound by these Official Rules and the decisions of the Sponsor, whose decisions shall be binding and final in all respects relating to this Sweepstakes. The Taunton Press, Inc., publisher of Fine Woodworking Magazine (“Sponsor”), 63 South Main Street, P.O. Box 5506, Newtown, CT 06470 USA. Sweepstakes begins February 20, 2019 at 12:01 a.m. Eastern Time and ends March 31, 2019 at 11:59 p.m. Eastern Time (“Sweepstakes Entry Period”). All entries must be received by the Sponsor during the Sweepstakes Entry Period. Sponsor is the official time keeper for this Sweepstakes. During the Sweepstakes Entry Period go to www.finewoodworking.com/sweepstakes/laguna (the “Website”) and complete the online entry form by providing your full name (as shown on your photo ID), email address, and ZIP/Postal Code. Limit one (1) entry per person per day for the Sweepstakes. Each individual who is eligible to enter, as described in Section 1 above (“Entrant”), must use his/her own email address to enter the Sweepstakes. You are not permitted to share the same email address with another Entrant. Use of any automated system to enter is prohibited and will result in disqualification. In the event of a dispute as to any Entrant, the authorized account holder of the email address used to enter will be deemed to be the Entrant. The “authorized account holder” is the natural person assigned an email address by an Internet access provider, online service provider or other organization responsible for assigning email addresses for the domain associated with the submitted address. Potential winners may be required to show proof of being the authorized account holder to be awarded the prize. All entries become the sole and exclusive property of Sponsor and will not be returned or cancelled. On or about April 23, 2019, Sponsor will select one (1) winner for the prize package described below in a random drawing from all valid entries received. The selected Entrant will be contacted using the email address provided with the entry and may be awarded the prize subject to verification of eligibility and compliance with the terms of these Official Rules. The potential winner will be notified by email on or about April 30, 2018. Failure by potential winner to respond to the initial verification within forty-eight (48) hours of notification will result in disqualification and Sponsor will select an alternate potential winner in the same manner. Odds of winning a Sweepstakes prize depend on the number of eligible entries received during the Sweepstakes Entry Period. If any potential winner is a Canadian resident he/she will be required to answer a time limited skill testing question without assistance, in order to be eligible to receive a prize. 6. POTENTIAL SWEEPSTAKES WINNERS ARE SUBJECT TO VERIFICATION BY SPONSOR. SPONSOR’S DECISIONS ARE FINAL AND BINDING IN ALL MATTERS RELATED TO THE ADMINISTRATION, OPERATION, SELECTION OF THE WINNERS AND OTHER MATTERS RELATED TO THE SWEEPSTAKES. Potential winners will be required to complete and return an Affidavit of Eligibility, Release of Liability and Publicity Release (where permitted by law) (collectively, the “Affidavit”) by the date specified by Sponsor, or an alternate potential winner may be selected. In the event: (a) potential winner cannot be reached for whatever reason after a reasonable effort has been exerted or the potential winner notification or Affidavit is returned as undeliverable; (b) potential winner declines or cannot accept, receive or use the prize for any reason; (c) of noncompliance with the above or within any of the aforesaid time periods, (d) potential winner is found to be ineligible to enter the Sweepstakes or receive the prize, (e) potential winner cannot or does not comply with the Official Rules, or (f) potential winner fails to fulfill the Affidavit-related obligations, the potential winner shall be disqualified from the Sweepstakes and an alternate potential winner may be selected, at Sponsor’s sole discretion, from among the other eligible entries received. Sponsor reserves the right to modify the notification and Affidavit procedures in connection with the selection of alternate potential winner, if any. Approximate Retail Value (“ARV”) of the Grand Prize is $5,000 USD. No cash equivalent to the approximate retail value of the prize will be awarded, prize is non-transferable, and no substitution will be made except as provided herein at the Sponsor’s sole discretion. Sponsor reserves the right to substitute the listed prize for one of equal or greater value for any reason. Winner is responsible for any taxes or fees associated with prize receipt and/or use. All federal, state, and local tax liabilities, as well as any other costs and expenses not specified herein as being awarded are the sole responsibility of the winner. Winner may be required to complete and return an IRS W-9 form (i.e. Request for Taxpayer Identification Number and Certification) or the equivalent form for Canadian residents. Prize will be awarded only if the potential winner fully complies with these Official Rules. Each Entrant agrees to: (a) comply with and be bound by these Official Rules and the decisions of Sponsor, which are binding and final in all matters relating to this Sweepstakes; (b) defend, indemnify, release and hold harmless the Sponsor, The Taunton Press, Inc., publisher of Fine Woodworking Magazine, and their respective parents, subsidiaries, and affiliated companies, celebrities, and any other person and organization responsible for sponsoring, fulfilling, administering, advertising or promoting the Sweepstakes, and all of their respective past and present officers, directors, employees, agents and representatives (collectively, the “Released Parties”) from and against any and all claims, expenses, and liability, including but not limited to negligence and damages of any kind to persons and property, including but not limited to invasion of privacy (under appropriation, intrusion, public disclosure of private facts, false light in the public eye or other legal theory), defamation, slander, libel, violation of right of publicity, infringement of trademark, copyright or other intellectual property rights, property damage, or death or personal injury arising out of or relating to a participant’s entry, creation of an entry or submission of an entry, participation in the Sweepstakes, acceptance, possession, attendance at, defect in, delivery of, inability to use, use or misuse of prize (including any travel or activity related thereto) and/or the broadcast, exploitation or use of entry. Winner acknowledges that prize is awarded as-is without warranty of any kind. The Released Parties are not responsible for: (a) any incorrect or inaccurate information, whether caused by Entrants, printing errors or by any of the equipment or programming associated with or utilized in the Sweepstakes; (b) technical failures of any kind, including, but not limited to malfunctions, interruptions, or disconnections in phone lines or network hardware or software; (c) unauthorized human intervention in any part of the entry process or the Sweepstakes; (d) technical or human error in the administration of the Sweepstakes or the processing of registrations; or (e) any injury or damage to persons or property which may be caused, directly or indirectly, in whole or in part, from Entrant’s participation in the Sweepstakes or receipt or use or misuse of any prize. If for any reason an Entrant’s registration is confirmed to have been erroneously deleted, lost, or otherwise destroyed or corrupted, Entrant’s sole remedy is another entry in the Sweepstakes. No more than the one prize package will be awarded. Entrant agrees that: (a) any and all disputes, claims and causes of action arising out of or connected with this Sweepstakes, or any prizes awarded, shall be resolved individually, without resort to any form of class action; (b) any and all disputes, claims and causes of action arising out of or connected with this Sweepstakes, or any prizes awarded, shall be resolved exclusively by the United States District Court or the appropriate Connecticut State Court located in Fairfield County, Connecticut; (c) any and all claims, judgments and awards shall be limited to actual out-of-pocket costs incurred, including costs associated with entering this Sweepstakes, but in no event attorneys’ fees; and (d) under no circumstances will Entrant be permitted to obtain awards for, and Entrant hereby waives all rights to claim punitive, incidental and consequential damages and any other damages, other than for actual out-of-pocket expenses, and any and all rights to have damages multiplied or otherwise increased. SOME JURISDICTIONS DO NOT ALLOW THE LIMITATIONS OR EXCLUSION OF LIABILITY FOR INCIDENTAL OR CONSEQUENTIAL DAMAGES, SO THE ABOVE MAY NOT APPLY TO YOU. All issues and questions concerning the construction, validity, interpretation and enforceability of these Official Rules, or the rights and obligations of the Entrant and Sponsor in connection with the Sweepstakes, shall be governed by, and construed in accordance with, the laws of the State of Connecticut, without giving effect to any choice of law or conflict of law rules (whether of the State of Connecticut or any other jurisdiction), which would cause the application of the laws of any jurisdiction other than the State of Connecticut. 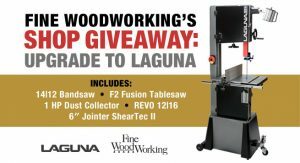 For Sweepstakes results, visit https://www.finewoodworking/sweepstakes/laguna after May 9, 2019. This Sweepstakes is in no way sponsored, endorsed, administered by, or associated with Facebook, Instagram, Twitter, and/or Pinterest. By entering this Sweepstakes, Entrants hereby release these named social media platforms from any liability for causes of actions arising as a result of this Sweepstakes.